Are you looking for advice about organizing children's artwork? Are you inundated with schoolwork and projects from your kids? Do you feel bad about tossing these precious memories because your kids were so proud to make them and show them to you? To keep everything they’ve ever made doesn’t make reasonable sense. There has to be a good way to organize children's artwork so that it can be cherished without taking over the house! Also, by learning to sort through your children’s projects, you can teach your kids and yourself a valuable lesson about organizing and letting go of things. If they learn at a young age, they can take this skill with them into the future. There are a variety of ways to organize children’s artwork and I felt it only best to lay out as many of them as I could so that you could find the one that works best for you. I don’t believe that any one way is better than another. So, what are the possible ways for organizing children’s artwork? 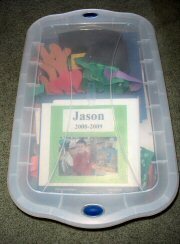 To forgo organizing children's artwork all together and just toss it all in a box isn’t very realistic. If you keep everything that your child creates for 13 plus years of school and multiply that times as many kids as you’re raising, it would get quite out of hand! Who has the space or the money to build a children's museum to display all that artwork. Besides, if it's all in boxes, no one is enjoying it! 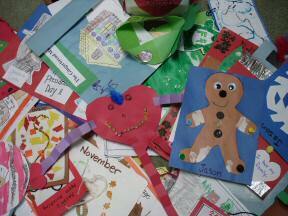 Organizing children's artwork is a good exercise for both the children and parents alike. It is important to sit together regularly and sort through all the artwork. Work together to select special projects that you both want to keep. Let the others go. It might be hard at first, but we should all learn to let certain things go. It helps us not get stuck in the past, but to make room for the great things to come in the future. Plus, this is a good skill for us ALL to learn, and the earlier the better. Your children will be better at realizing what means most to them. Take photos of the artwork you want to remember, or scan them with a scanner. You can do a variety of things with this. Keep a file on your computer of all the artwork your kids do. Be sure to organize them by child and school year so you know what’s what when you go back to reminisce. Use the digital photos on your computer as a screensaver. Or load them onto a digital photo frame. Print pictures out and put them into a scrapbook. Miniature versions of the original artwork take up much less space. Another option for those very special masterpieces is to order a bound photo book which you can get from many online photo companies. 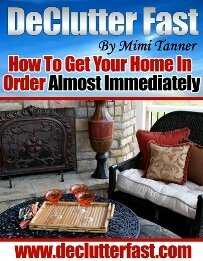 You simply need to upload your photos to their site, follow their instructions and build a great book. In fact, you can turn those digital copies of the artwork into calendars, t-shirts, mugs, mouse pads, you name it! You could turn any of them into a nice gift for the Grandparents! One more thought, be sure to take a few pictures of your child holding their artwork. This will help with the memories and show just how proud they were of their masterpiece. See! Organizing children's artwork just became a really fun project for you to do with your kids, not some terrible chore. There are several ways to showcase special pieces. Here are a few I found. Showcase favorite pieces with a nice bulletin board. Depending on space and the type of room, you could do an entire wall of cork board, or just a few rectangles/squares around the room which then frame the individual pieces. You and your child can decide which pieces deserve to be hung and you can change them out regularly. You can use good ole’ masking tape and a special area of wall space designated for artwork. You can purchase shadow boxes or inexpensive Lucite frames that can display the artwork. These are easy to change out regularly. Another variation is a clothes line display. Anchor a piece of string from corner to corner across a wall. Hang the projects from the string with clothes pins. And oh yeah, there is always the refrigerator. Now onto organizing children's artwork you decided not to display, but couldn't part with either. To store the artwork you decide to keep that isn’t showcased you may want to consider a file box, an artwork portfolio, or a large plastic storage box. For the file box method, select one that’s of moderate size. Over time, as it fills up, you will need to go through it again and purge items to make room. Don’t just keep adding more boxes. Be reasonable with yourself about how much room you really have to keep these items, and then stick to it. Regular sized artwork can be filed this way, but larger flat artwork will need to be kept in an artwork portfolio. These are large folders that latch closed and have a handle for carrying them around. Larger 3-D items can be kept in a plastic storage bin appropriately labeled. I personally went with storing all the artwork I chose to keep in a large plastic box for now, simply because I had one on hand. There is still room in there for more artwork so I can add to it if I want. Organizing children's artwork is kind of new to me. My first child is only now finishing up his first year of preschool. Wow! The amount of projects they make is amazing! So, now, it's time to sit down and have a little art review with my little Picasso!